Egyptian Mint has a flavor similar to Apple Mint. But, this is a much more robust plant with sturdy upright stems and large velvety gray leaves. Mint freely crosses and many different kinds have evolved from this wild hybridization. Some of these wild plants are great and some are stinky or taste bitter. Scholars disagree on which mint was actually the mint of the Bible, but this is a nice one from the same region. There were probably many mints then, as there are today. That Mint was tithed at all, in ancient times, shows the value the Pharisees placed upon this herb. Imagine determining what one tenth of your mint crop was! 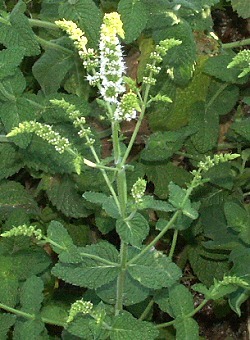 Mint was valued for its fresh aroma and sweet taste and often used to flavor meat. Also an important “strewing” herb, mint stems were hung in doorways and thrown on dirt floors to mask the effects of inadequate sanitation. 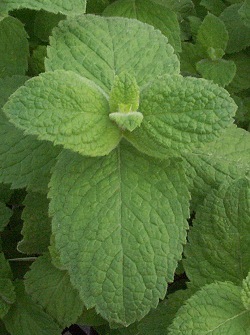 Egyptian Mint is one of the six plants chosen to be in our Biblical Herb Garden Six Pack. It also makes a great addition to our Kitchen Herb Garden Six Pack. This plant is often available in plug trays. These trays hold 128 of all the same plant. They are a great low cost way to fill a lot of space. Each cell is 3/4 of inch by an inch. Check here to see if Egyptian Mint Plug Trays are available.